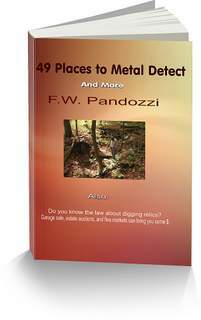 If you are metal detecting in Tennessee, then you should understand a few of the laws. The first one is the Antiquities Act of 1906. At the link below is an explanation of that law. I have also provided a few more links to other laws, as well as information about some of the problems people face who break this law. Be sure and read through the entire pages. Although the Antiquities Act does not specifically mention "metal detecting", you need to understand what that law says about digging artifacts. The following story was told to me by a man that was harrassed by State Officials for metal detecting on a public fishing area in Tennessee. Apparently this individual had been fishing a local stream. Throughout the years the area was used by many fishermen. The only signs that were posted read "Public Fishing Area". This fellow was not having much luck fishing so he decided to try his luck at metal detecting. He began to metal detect the grassy parking area used by the fishemen when he was approached by another man. This other guy worked for the State Environmental Department and told the individual who was metal detecting that he just broke the law. The fellow metal detecting asked to see the law in writing. When the State worker could not instantly show him the law, the man metal detecting told him in so many words to "bleep, bleep, bleep." Two hours later a Sheriff and an Archaeologist showed up at his doorstep. Apparently, the man who told him he broke the law wrote down his license plate number and it was then traced to his home. Again, the man asked to see a law that stated that he could not metal detect on that particular property. At that time the Archaeologist showed him a piece of paper that explained the ARPA law. However, the Arkie and the Sheriff messed up. The individual was never seen removing any item from the ground. Therefore, no charges were ever issued. However, had this individual been seen removing an item that was at least 100 years old, he would have been arrested. Don't State officials have better things to do? The Antiquities Act of 1906 is the grand-daddy of all land laws. And there are two more laws to be aware of. The next two laws are basically mirror images of the Antiquities Act. The National Historic Preservation Act - NHPA. To keep this all simple, if you are metal detecting in Tennessee, especially on State Land, do not dig anything that you believe is an artifact, or anything that is older than 100 years. For detecting in Tennessee, town, village and city parks, you'll need to check with those local officials. I was the first to film a metal detecting, TV series. And when I did, the Archaeologists through a sissy fit. Find out why. Have you been metal detecting in Tennessee ghost towns?